On a market where all music systems and speakers look the same, Shape Audio has gained the reputation of being the only true high-end music system combining uncompromised design, technology and craftsmanship. With its (r)evolutionary approach, Shape Audio has totally changed our perception on how a music system should look, behave and be handled. These stunning music sculptures are made of solid metals and instead of the traditional left/right system, based on two separate loudspeakers, the sound is omnidirectional (but still stereo) from just one sculpture thanks to highly sophisticated DSP technology. Handling the music system is done wirelessly and intuitively using your smartphone or computer (traditional handling and connecting other audio sources such as a CD-player is of course still possible). 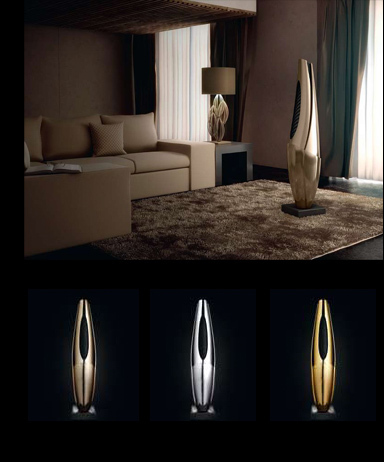 The Organic Harmony collection comes in three versions: bronze, silver and gold – made in limited editions of 99, 5 and 1. All versions are made using ancient casting methods and labor intensive hand polishing. Added to this are state-of-the art technologies creating the inner net structure and a true high-end audio electronic system generating a sublime sound.